Are Y’all Hungry? Let’s Have Some Msakhan! 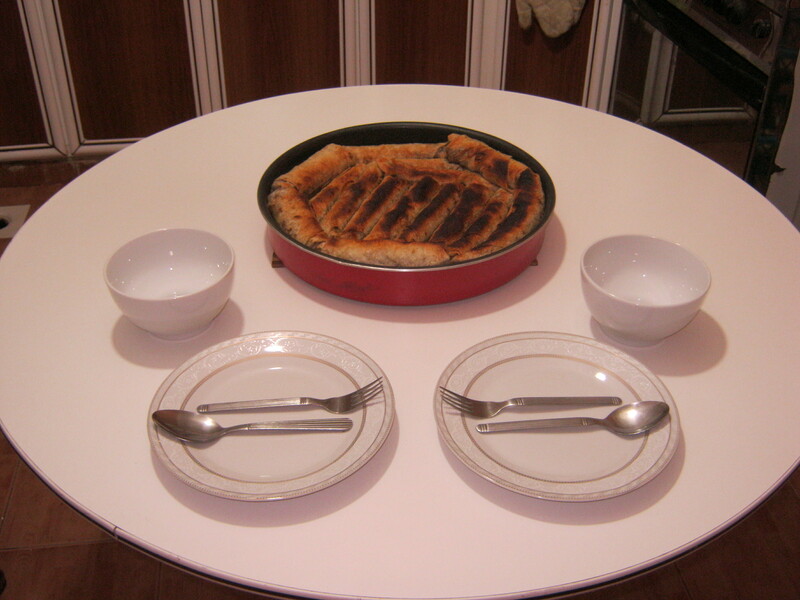 We haven’t had msakhan for a while, so Zeek and I decided to make it for supper a few days ago. If you haven’t had it, you’re truly missing a treat! It’s quite easy to make, and uses ingredients that you probably have in your cupboard right now… well, except for the bread, but that should be fairly easy to get hold of. 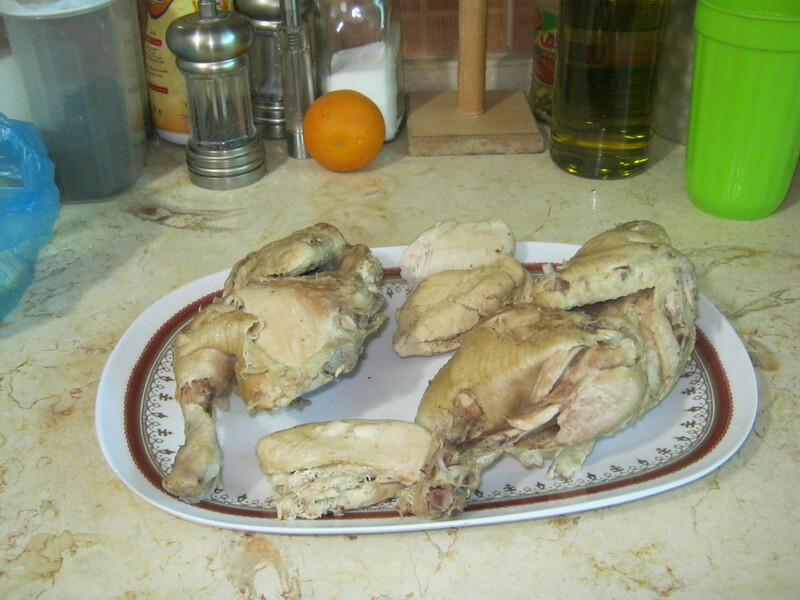 Msakhan is Arabic for reheated. 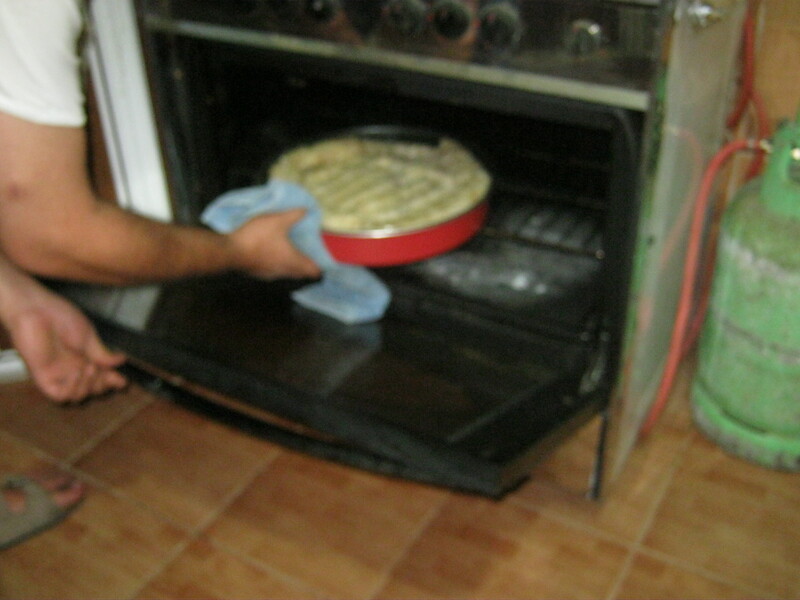 It derives from the verb sakhan, to heat. 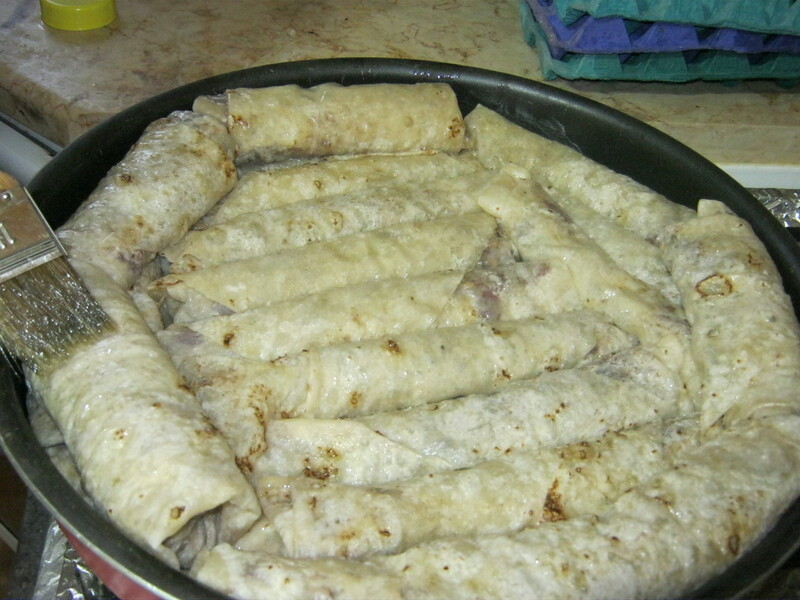 This is a typical Palestinian dish, originally from Qalqulia, north of the West Bank, made with day-old shraak bread moistened with olive oil, onions, garlic, sumac and other spices. I’ll tell you all about those as we go along. It is always accompanied by yoghurt, “the cream of life”. 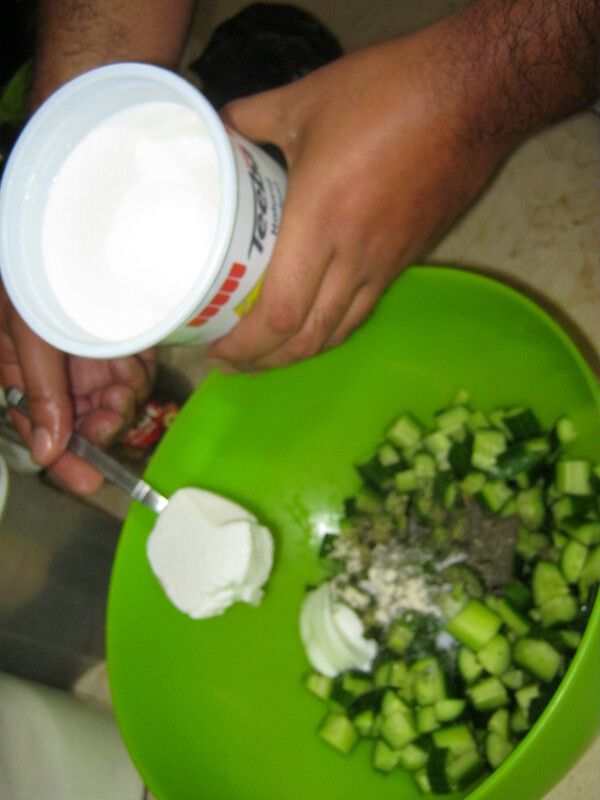 We choose to make a salad of cucumbers and yoghurt that I’ll show you after we finish the msakhan. Ready to cook? Let’s get out to the kitchen and rattle some pots and pans! The first thing we want to do is boil the chicken. Cut the old girl in half and drop her into the pot with a few bay leaves, salt, pepper, and onions. 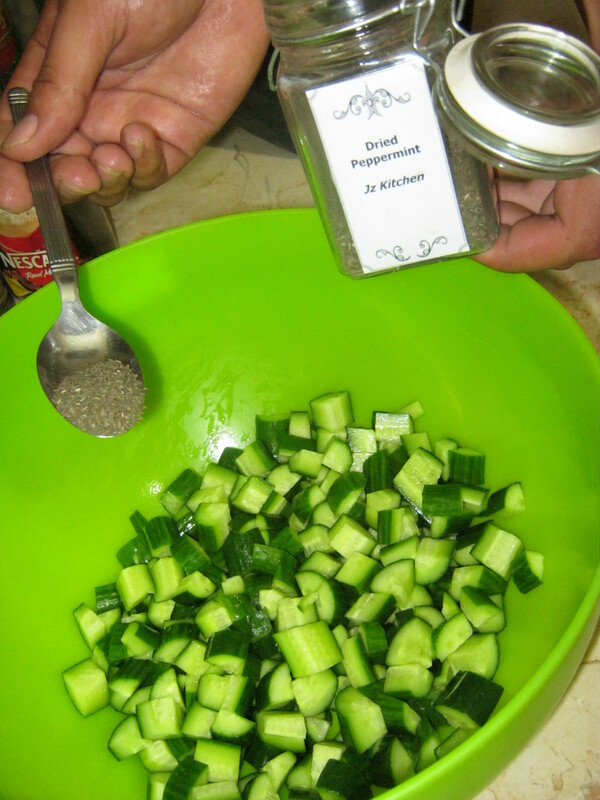 I usually add a cube or two of chicken bouillon, too, just to give some added flavor. Now that the chicken is cooked. Lay it aside to cool. We’ll deal with her a little later. 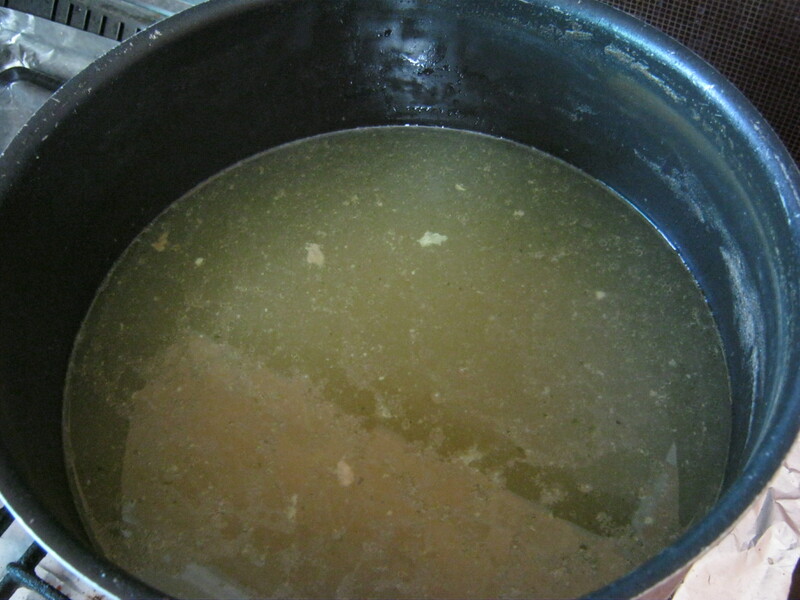 Look at this beautiful broth! 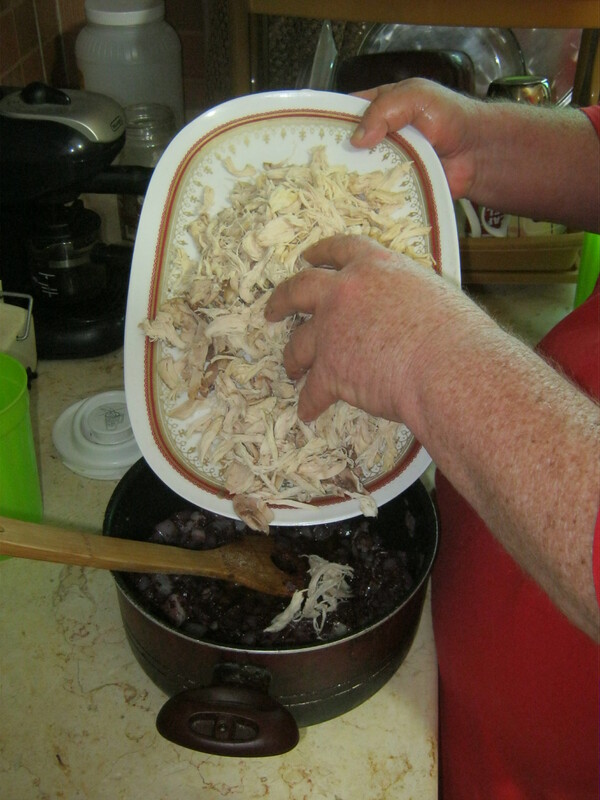 This is going to be good, good, good when we need to cook some rice or some other dish needing chicken broth. Now, lets chop five onions. Don’t chop it too fine. Make it about 1 cm pieces; we want to know the onions are there! 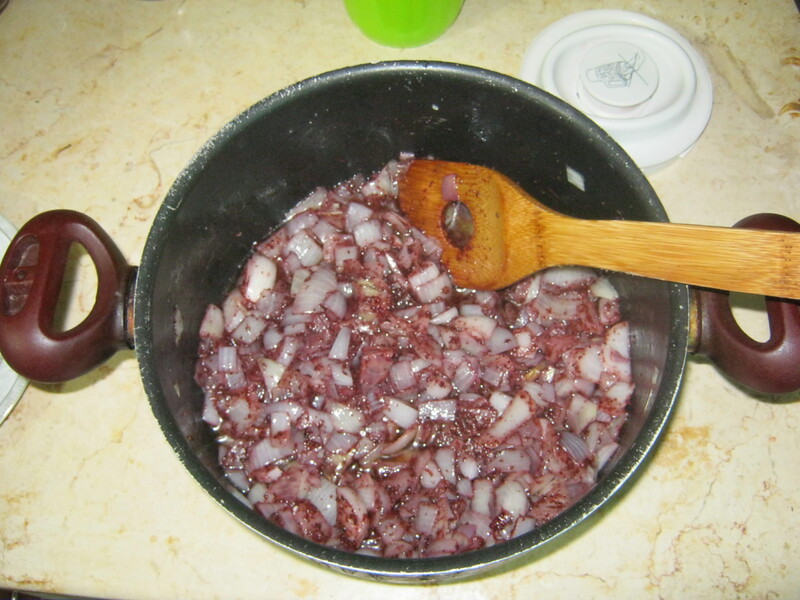 Put the onions into a pot with a bit of oil and add about 6 Tablespoons of sumac and just a pinch of salt, and sauté to blend the flavors. Don’t overdo it, we want the onions to retain some of their crispness. 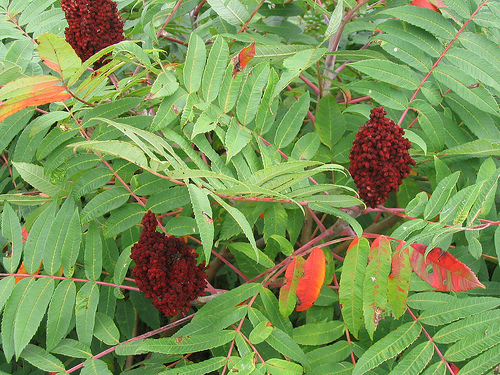 This is probably a good time to talk about sumac. I’m not sure how common it is in the Western world. 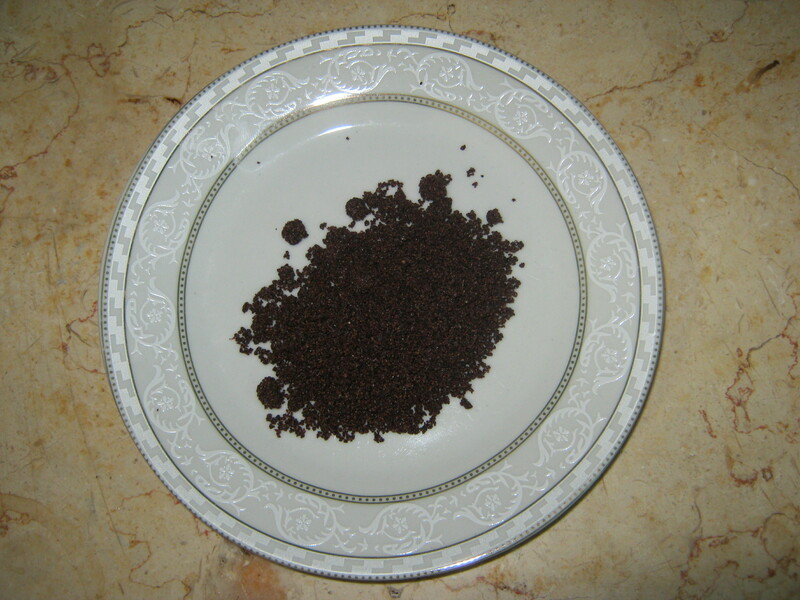 Sumac is a shrub or small tree. The fruits grow densely on spikes and dry to reddish-purple. They are ground to produce a sour purple spice. The tree itself is of the same family as a tree I knew back in the States. The old people called it Shoemake, and they grew thick as thieves all round the countryside. I see a similar tree in the nurseries and gardens over here. A quick Google search shows that it’s fairly easy to obtain in UK, US and Europe. That’s enough botany for the day, I reckon. 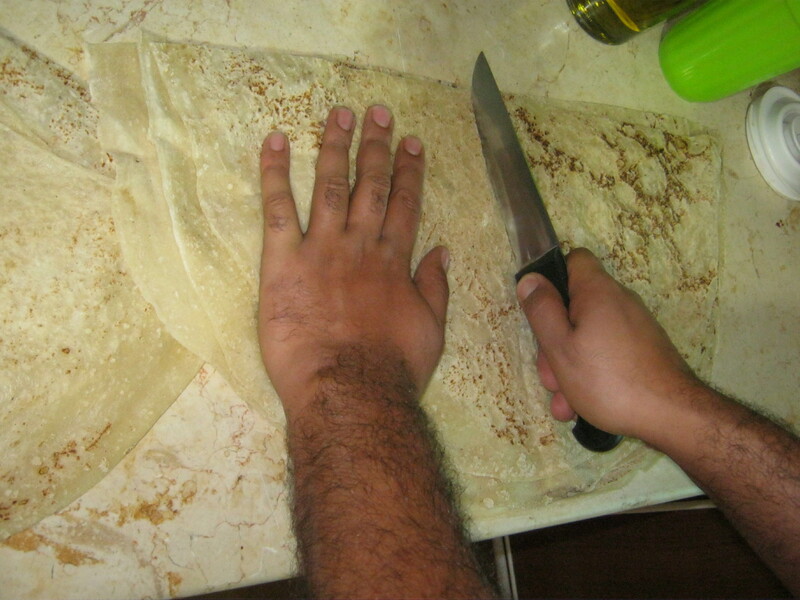 Let’s get back in the kitchen and see what we can do with this msakhan. Now we need to give our attention to the chicken, who has been patiently waiting and cooling. 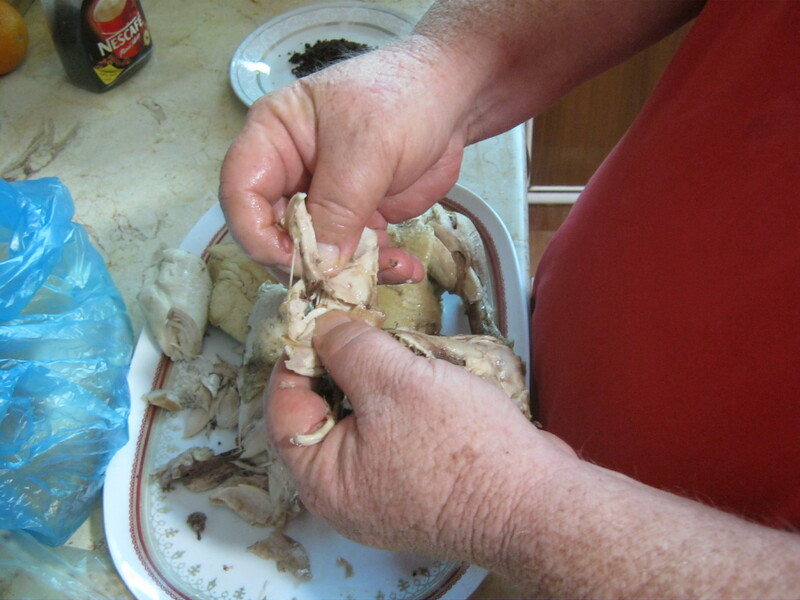 First we need to get rid of the skin; we don’t want that in our msakhan. After she’s stark naked, start taking the meat from the bones and shred it. I prefer to do it with my fingers. 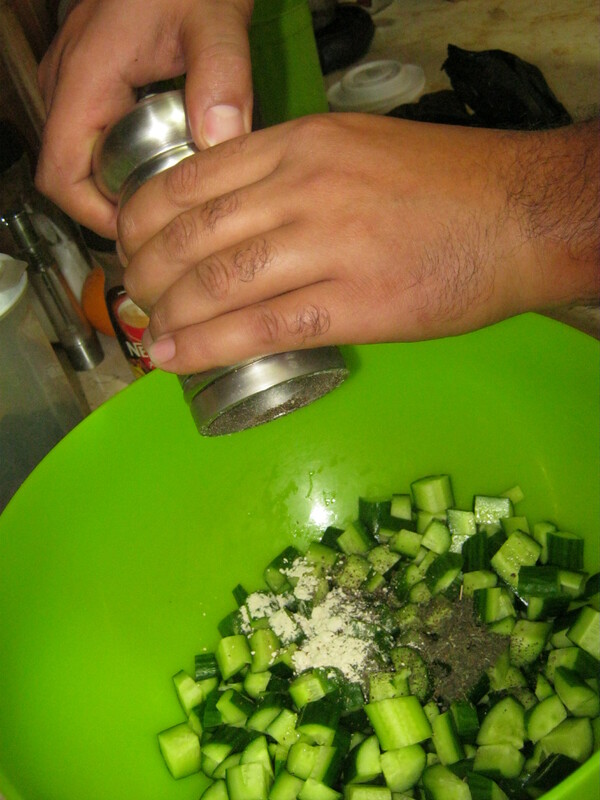 Some use a couple of forks or a food processor. I like to get ‘up close and personal’ with my ingredients, so I shun those methods when it’s practical. 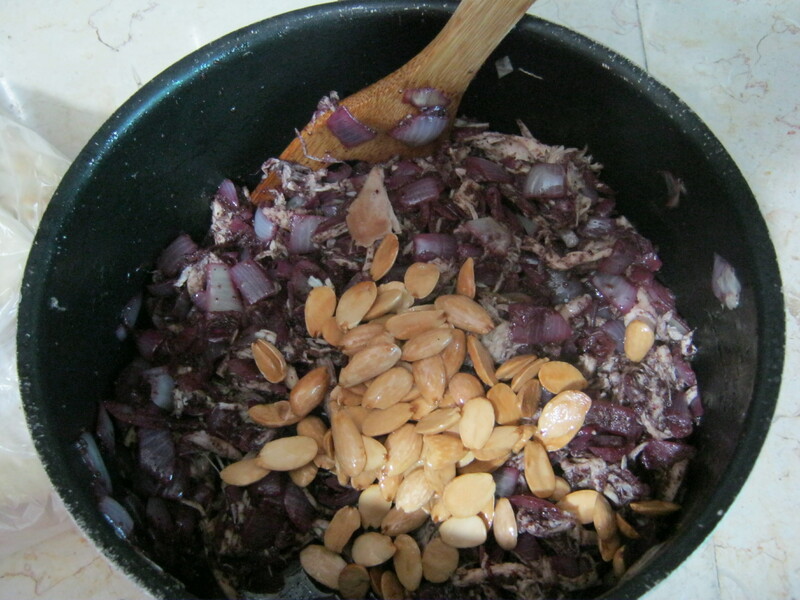 After it has been shredded, add the chicken to the onion sumac mixture. 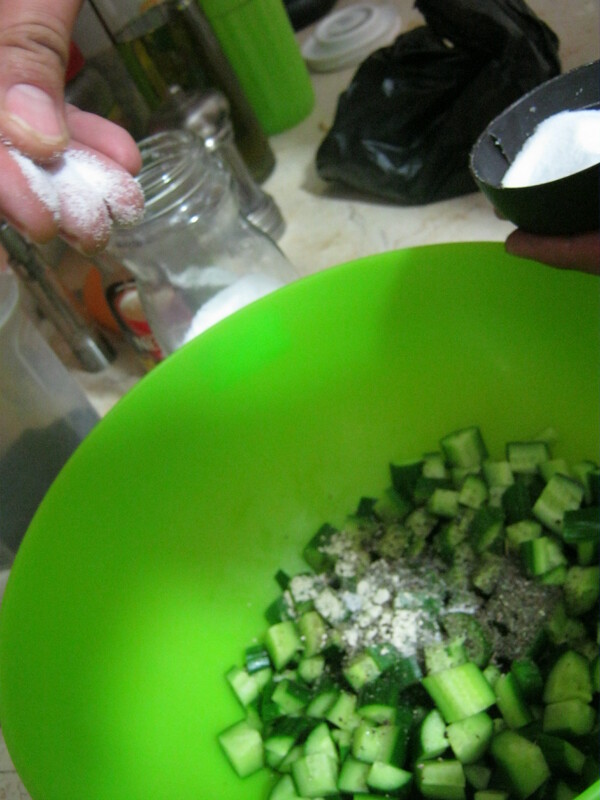 Give it a good stir, and add some fried or toasted almond slices. This is the bread we use. It’s called shraak. It’s quite thin and baked in large round loaves. 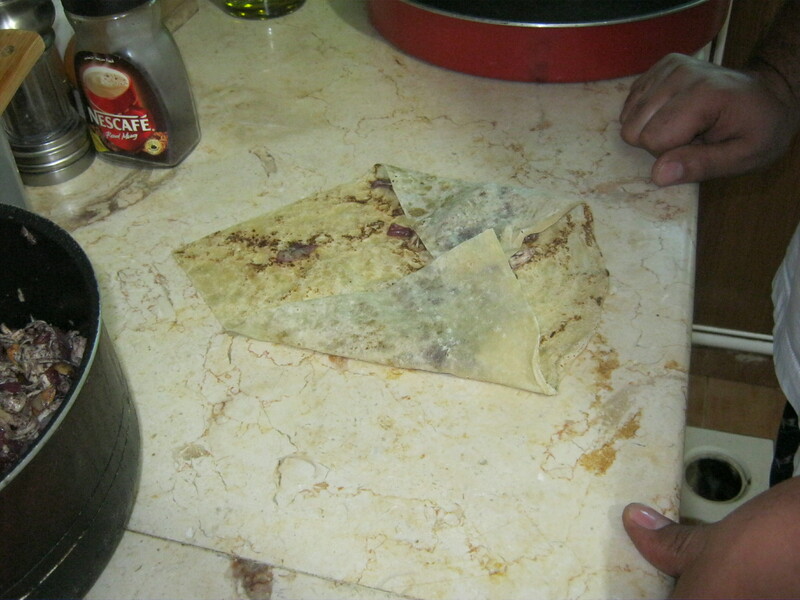 Note: I haven’t tried it, but if you can’t get shraak flour tortillas or several thicknesses of phyllo “might” work. 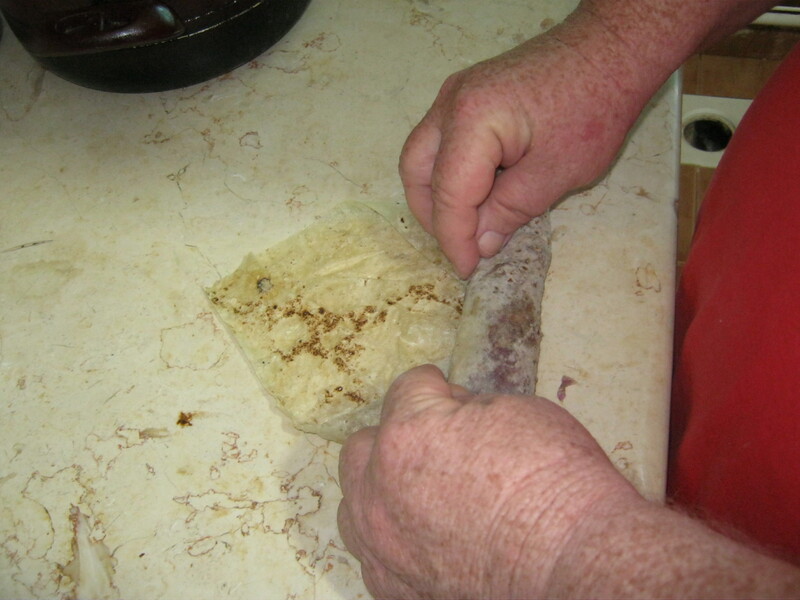 Cut the bread into quarters in preparation for rolling the sandwiches. And roll like a cigar! 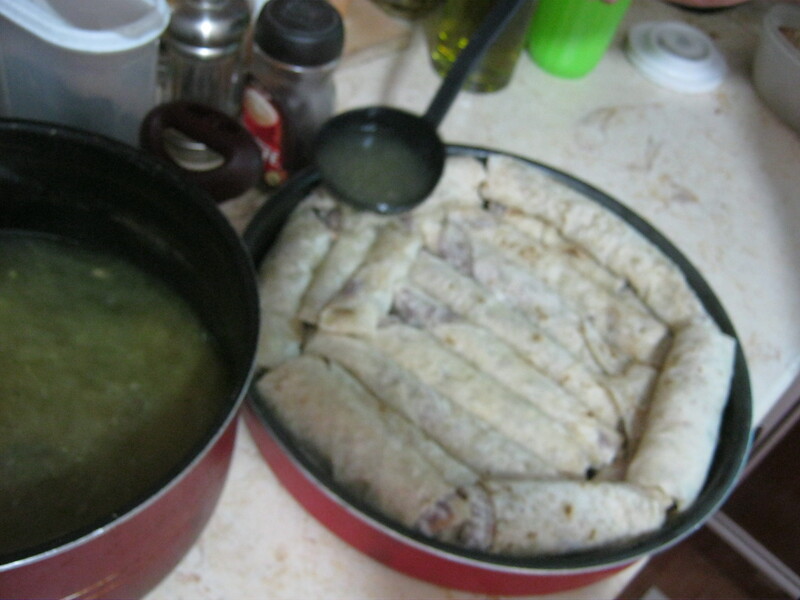 Arrange the rolled sandwiches in a large, deep pan and add 3-4 ladles of chicken broth. Brush the bread with a bit of olive oil. Oh! That makes the bread beautifully crisp and the taste is out of this world! And, then it’s off to the oven for 5-10 minutes under the broiler. I apologize for the quality of the picture. I was shaking with anticipation! Are you ready to eat yet? Wait, we need a side! We eat yoghurt with damned near everything. It makes beautiful salads, and I promise you are going to love this one. 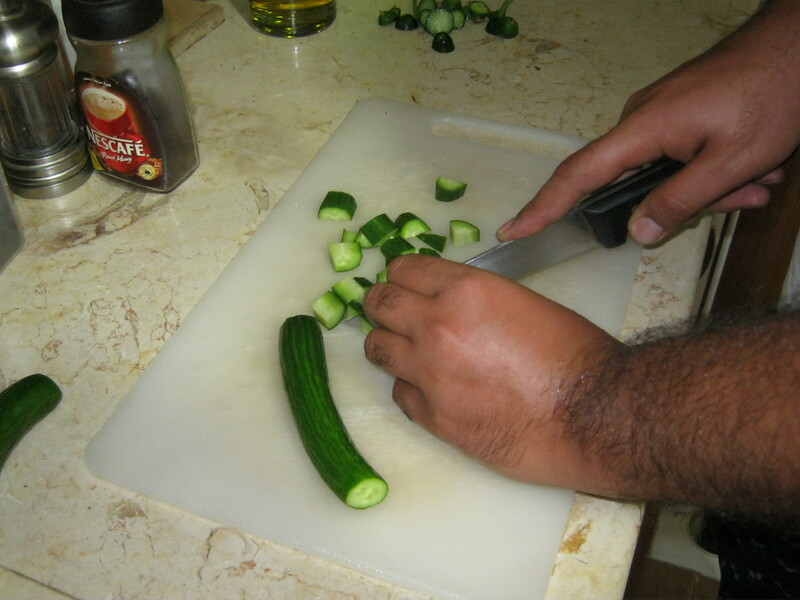 First, let’s cut about 6 cucumbers. I like to slice them length-wise into quarters and then slice them. 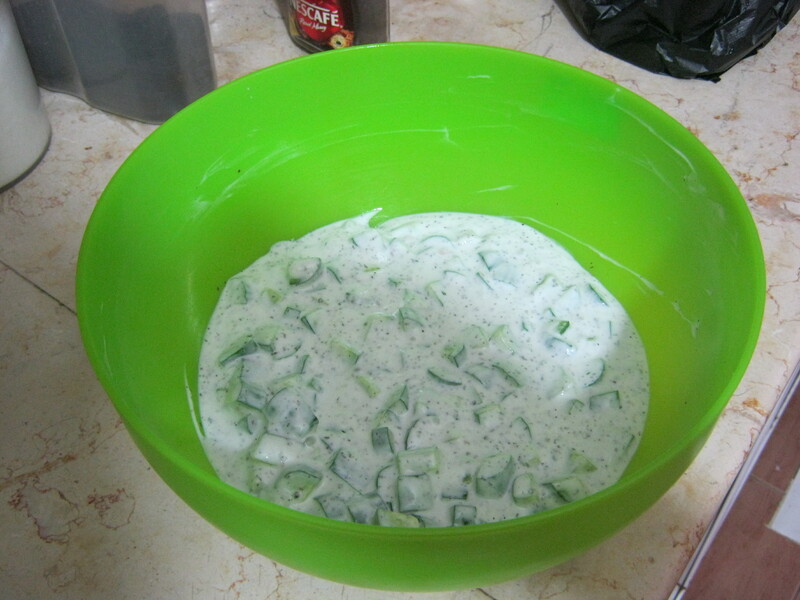 To the cucumbers, we will add 1 tablespoon of dried mint, 1/2 teaspoon of garlic powder (more or less according to taste), a few grinds of black pepper, a pinch of salt, and about half a liter of yoghurt. Give it a good stir, and we’re ready to eat! If you decide to try this easy dish, and I know you’re dying to do it, post a comment here to let me know what you think of it. As we say over here, “Saha!”, may it rest easy on your heart! 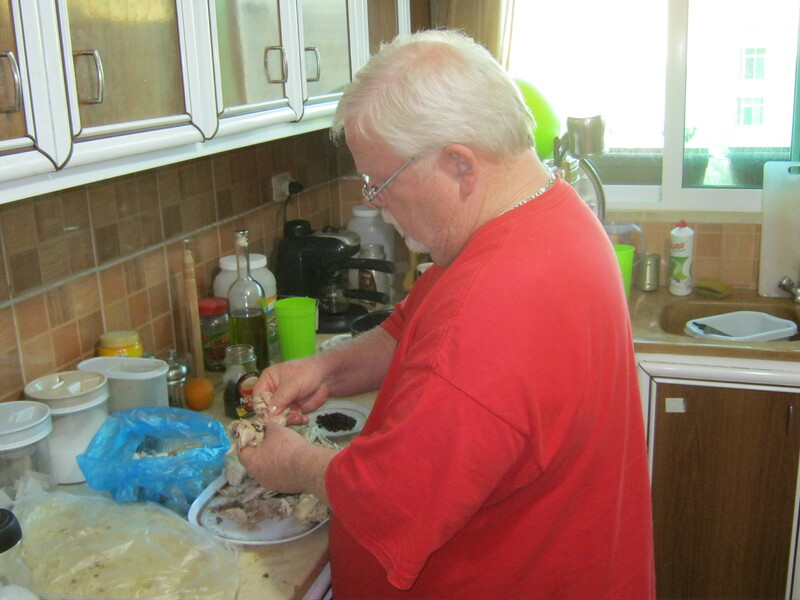 This entry was posted in Random Musings and tagged Broth, Chicken, Cook, cooking, Home, msakhan, Olive oil, Onion, Palestine, recipes, shraak, Tablespoon, West Bank, writing. Bookmark the permalink. 13 Responses to Are Y’all Hungry? Let’s Have Some Msakhan! Sounds delicious! I may have to try that! Thanks for sharing! Thanks for stopping by, and I hope you’ll enjoy it as much as we do! Looks so yummy! I like Msakhan so much. 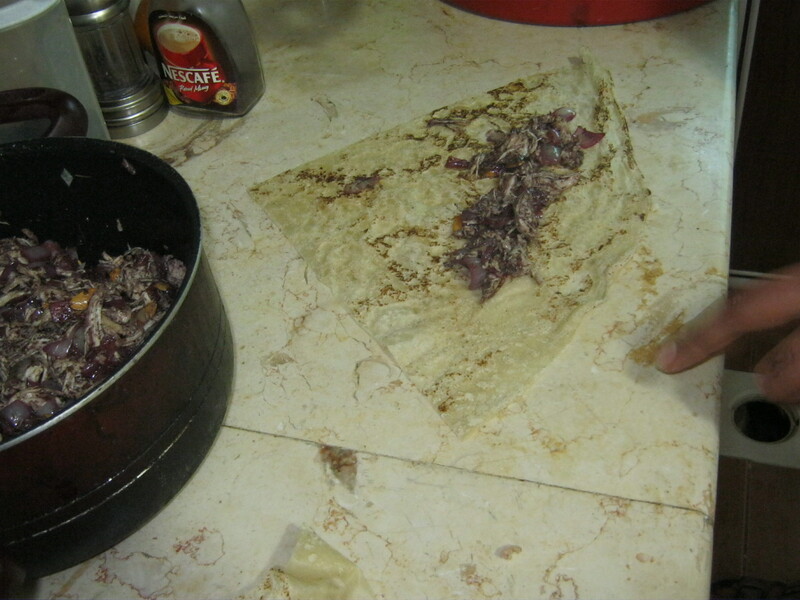 The other way to make Msakhan is to spread the chicken on top of the bread without rolling it, as layers. But the sandwich way is less messy. I like it. Now, I have to try your recipe. Thanks for stopping by, Jaraad! I love Msakhan the way you described. Zeek’s Mom makes it that way. By the way, it’s fun to eat it that way, too! You know, we Westerners were always, always told not to eat with our fingers. 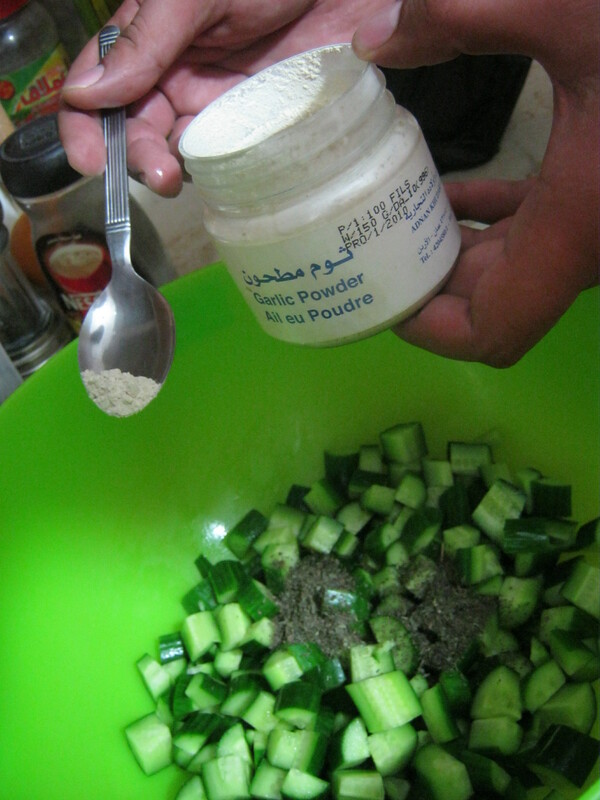 I love the way (we) Arabs eat so many things without spoons and forks! What an interesting dish. My other half is from Egypt. I’m always looking for dishes with interesting flavors for him to taste. Being Canadian (that would be me) we bring interesting ingredients to the pot when we cook together. This looks yummy. Never had sumac. Thanks for coming by! I’d never had sumac until I came here. It gives a lemon-like sourness to the dish and I just love its color. I bet your Companion knows this dish. Give it a shot, and let me know what you think of it! Yum! Is dinner always like this at your place? You don’t have a Pinterest button, but I added this is as a pin to my board for Chicken recipes anyway, so I could share it with my followers. [http://pinterest.com/pin/183943966000867858/] Think about adding a Pinterest button as one of your post sharing options. Thanks for stopping by and commenting. Dinner at our place is like this, ummm 75% of the time. These are quick, easy “down-home” type meals over here. Thanks for the suggestion about the Pinterest button. I’ll add it first thing at morning! Hope you’ll come back often! All your dishes look great Jim. Chef Jim, from now on. Thanks, Caz, and thanks for coming round!